Easily copy the music from your Apple iTunes music library between computers by enabling the Home Sharing feature using this tutorial. Note: This tutorial is geared toward iTunes version 12.9. Ensure the latest version of iTunes is installed on both computers. Select “File” > “Home Sharing” > “Turn On Home Sharing“. If prompted for a username and password, enter your Apple Store credentials. Repeat steps 1 & 2 for any other computers you wish to share music between. Ensure all computers are connected to the same network. Check “Share my library on my local network” to share your entire library. 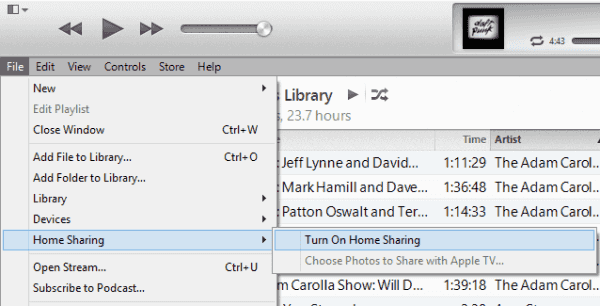 Optionally, you could select “Share selected playlists“, then check individual playlists if you wish to limit sharing. You can also require a password for access to the library allow play counts to be updated through sharing usage. 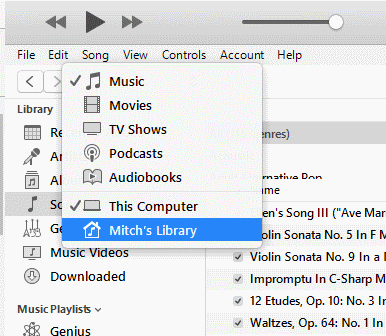 Select the drop-down menu located in the upper-left corner of the iTunes window, then choose the music library you would like to access. Copy any music from a shared library by dragging it left. A sidebar will appear as you drag, where you can drop it into your local library. no, i do these steps exactly with both pc’s having the same version of itunes 12.9.3.3 and it still doesn’t work.. We can see the shared libraries but the dragging left part does not do anything.